All the information I’m about to go over is nothing new, I’m just trying to organize all my notes on pen testing mssql. Hopefully my notes will help others. All the commands and instructions are Linux based so keep that in mind. The first thing you’ll need to do is discover IP addresses that have mssql running. So you’ll accomplish this by running some type of scan. The scanner of choice is always nmap but there are some things you’ll need to consider when scanning for mssql. The default port for mssql is 1433 but just like with any service it can listen any port. So for starters it’s definitely a good idea to scan an IP range looking for port 1433. Step 1 scan for port 1433, this can be done using the following nmap command. This will only scan for port 1433 on host 130-140, your IP range will vary. My output is below. 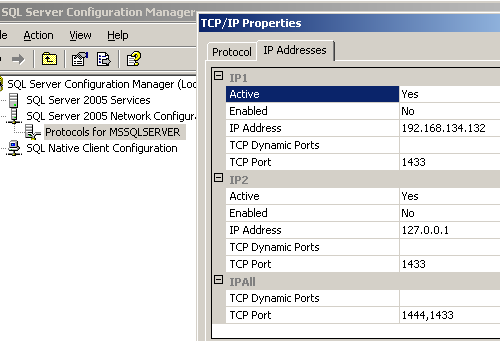 In this case the 131 host port is closed but the 132 host has port 1433 open. So great success we’ve found a box running mssql. Hold your horses because this is simply the beginning. If you’re scanning is focused then this type of scan is fine, meaning I’m not scanning thousands of hosts I’m only focused on a handful of hosts. If I’m only concerned about scanning a handful of hosts then my next step would be to determine two things. To determine the version of the database we can once again turn to nmap. The “-A” option will try and determine as much information as it can about the service on port 1433 in this case. The “-A” option will also try and determine the underlying OS running as well. Below is the output from this scan. So you’ll notice in the output nmap is reporting the version of mssql to be SQL Server 2005 which is correct in this case. Knowing the version is very important because different versions of SQL Server provide different security features and also have different vulnerabilities. There are other ways of determining the version of sql server without authenticating but to me nmap is the best solution. Next let’s talk about looking for other ports that mssql may be listening on. For multiple reasons, like load balancing, mssql can listen on multiple ports. When pen testing mssql we want to know what those ports are so we can bang against them. Depending on the configuration you can authenticate to every listening mssql port. One thing to keep in mind is that you can authenticate to mssql using your normal windows / network / active directory credentials or you can authenticate using an account that was setup on the mssql server. This is basically known as windows authentication or sql authentication. When setting up the sql server and ports the database administrator will have to configure on how this authentication takes place. The easier target is using sql credentials as those are typically configured with a weaker password policy. Now that I’ve discussed some of the issues let’s get cracking. So to determine additional ports that a database may be running on we’ll once again turn to nmap. This time I told mssql to also listen on port 1444 and 1433. So now go ahead and run the same nmap command as before. So we see that nmap reports back ports 1444 and 1433 are listening. You may be wondering how nmap knew that port 1444 was open. MSSQL runs a service called the “browser service” which runs on port 1434 and uses UDP instead of TCP. If this browser service wasn’t running nmap wouldn’t be able to pull this information. Basically nmap queries port 1434 asking for any other instances that are running on different ports. It does this using the mssql nmap script. There are a couple of other tools here and here that do the same thing but I stick with nmap since it’s already baked in. So the browser service and additional ports is a very important to keep in mind when pen testing mssql. Now we have more information about our target which hopefully means we’ll find a weak spot that we can exploit. Once you know the version it’s always recommended to search CVE (common vulnerabilities and weaknesses) and it may also not be a bad idea to search inside the metasploit tool as well. There aren’t a whole lot of remote code execution vulnerabilities for anything SQL Server 2005 and beyond but it’s always worth checking just to make sure. So if they aren’t running an old unpatched version of mssql then that means you’ll need credentials to authenticate to the sql server. This means we’ll need to try and brute force the credentials. The main tool I like to use to perform brute force attacks is medusa, another good alternative is hydra. I have had different degrees of luck with both tools so it may be useful to run both tools although my default is medusa. I will only cover how to use medusa, below is the typical command line options that you feed into medusa. The -h is the host, the -U is the username list, -P is the password list, -O is the output file, -M is the module you want to run against in this case it’s mssql. Below is the output of this command. Your output file resemble the following. # Medusa has finished (2011-12-12 22:59:46). The file output is much easier to parse and we can see in the next to last line that it was successful in finding credentials of username = sa and password = password. By default medusa will run against the standard port which is 1433 in this case, if you want medusa to run against a non standard port you’ll need to include the “-n” option. So you see that medusa was able to authenticate to port 1444 with the same username and password. This may not always be the case. With mssql you can configure different ports with different credentials so it’s always best to run a brute force tool like medusa on each individual port and see if you get any hits. Medusa and hydra can take a while to run in my case I had a very small dictionary seen below. Large dictionaries can take some time to run so keep that in mind when you’re brute forcing using these kinds of tools. So we got lucky and we credentials for a mssql database, that’s awesome but it’s just another step in the process. Going forward we have a couple of options. As a true attacker you would consider the following options. I’m not going to touch on the third option but I will discuss the first and second option. So for the first option once we have credentials we can start to query the database. In this scenario I’ve got the best kind of credentials you can ask for on a mssql database which is the “sa” user. This will not always be the case but it’s the example I’ve chosen to follow. One good thing to run with credentials is metasploit’s enum tool. This module basically gives you an overview of the sql server configuration and some note worthy security related configurations. Below is how to use mssql_enum. Below is the output of running the tool. [*] All System Accounts have the Windows Account Policy Applied to them. [*] No Account with its password being the same as its username was found. [*] No Accounts with empty passwords where found. I’m not going to go through this entire output but all of it is relevant to security configuration. Things to note are permissions which the service runs as, password settings (e.g. account lock outs, password expiration), and stored procedures that are available. You can read more about stored procedures but the main thing to know is that they extend the functionality of mssql by giving easy access to common tasks such as granting access to a database. The one stored procedure every pen tester wants access to is the mighty xp_cmdshell which allows you to execute operating system commands with a database call. So information that you can obtain, xp_cmdshell enabled or disabled, about the database will help you to further assess or pen test the setup. Going forward it’s best to have some sort of mssql client so that you can make sql queries to the database. I’m a fan of keeping things lightweight so I prefer command line clients and not GUI (graphical user interface) clients. So for accessing mssql from Linux I recommend sqsh and as for accessing from a windows PC I like the Microsoft SQL Server Command Line Utilities which will first require an install of the Microsoft SQL Server Native Client, both microsoft tools can be found here. Now we’ll get items of interest such as stored procedures but first let’s use one of the clients mentioned to access and run some sql queries. The syntax for both clients is very similar but first let’s look at the microsoft client. You’ll first need to change to the proper folder where the sql client was installed. C:\WINDOWS\system32>cd "c:\Program Files\Microsoft SQL Server\90\Tools\binn"
So to connect to 192.168.134.132 run the following command. After you’ve run the above command you should see the following. So the “1>” is the prompt where you will enter your sql commands, let’s just run a basic sql query to confirm everything works, we’ll query for the version in this case. So after typing your sql query you’ll be dropped down to your second prompt “2>” there you will need to type “go” and hit enter for it to run your query. Running the sqsh client you’ll get similar results. Just type “exit” if you want to leave the client. Another thing to note is the help menu for both commands. Below is the help command for sqsh. One thing that might not be very clear from the help output is how you would connect to a different port. By default both of these clients connect on port 1433, if you want to connect to a different port you’ll have to use the following syntax. So getting the versions of the database proves that our clients are working correctly and we have access, next we’ll focus on sql queries that will extract some useful information that a pen tester could leverage. Now as an attacker I mentioned the three basic options of plunder database, use credentials for further access, and hosting malware. The commands above are examples of “plundering” the database and these commands merely scratch the surface. Another plundering idea would be to search all databases for “items of interest”. Once you have credentials to the database you have plenty of options for plundering. The second step I mentioned was using your credentials for further access. Two things come to my mind which is cracking sql passwords and gaining access to the underlying OS that hosts the database. An attacker would want to know sql passwords because often those passwords are reused. That reuse includes other databases and possibly other credentials such as active directory credentials. The other piece of gaining access to the underlying OS of the database will allow you to do a number of things such as key logging, searching the file system, pass the hash technique, etc. So I’ll first discuss how to crack the encrypted passwords inside of a mssql database. Just so we’re on the same page a password is not supposed to be stored in clear text in a database is suppose to be stored encrypted as a cryptographic hash. Cryptographic hash is a fancy way of saying that the password cannot be easily determined and they encrypted value is commonly referred as a hash, not to be confused with the delicious food. So the next step is to get these hashes and crack’em. Now you can take that password hash and feed it into a password cracker such as john the ripper but before you do that you’ll need to add a zero plus X “0x” to the beginning of the password hash. This needs to be done because john the ripper expects password hashes in certain formats and if you need to know what that format is for various types of hash functions then pentestmonkey is a good resource for this type of information. So your modified hash with zero plus X in front should look like the following. Now put that into a text file so we can feed it to john the ripper, in this case I named it mssqlHash.txt. Next all you have to do is use the command “john” along with the file that contains the password hashes as below. Here john the ripper was able to crack this hash and determined the password was “secret”. So now that you’ve cracked some passwords on this database there’s a good chance that username and password will work on other databases within the environment you’re testing. Seeing how server and database admins like to keep things together that same username and password will probably work on another machine on the same vlan so just start nmap scanning to find those open ports then add the username and password you found into your medusa dictionary then let medusa do it’s brute forcing and hopefully you’ll find another database you can gain access to. The last technique I’ll discuss is gaining access to the underlying operating system that the database is running on. Having sysadmin credentials on the database is awesome but having admin on the underlying operating system is even better. As I mentioned before the stored procedure xp_cmdshell is the best way to gain this kind of access but as you can see from the metasploit enum module xp_cmdshell isn’t always at our disposal. The xp_cmdshell was enabled by default on mssql 2000 but mssql 2005 and beyond by default does not enable this stored procedure. Even so a mssql 2000 database administrator could disable it as well. One way and maybe the easiest way is to use metasploits mssql_payload module to enable the xp_cmdshell and give you a meterpreter shell back. Below is the command you’ll need to run. You have to set at least the host you’re targeting (rhost) and the password of the “sa” account. This module will not work unless the user you’re authenticating with has sysadmin credentials, so the account doesn’t have to be “sa” but it has to be a user with a sysadmin role. So at this point we have a meterpreter command prompt on the target computer which is better than a regular windows command prompt. From here we can launch a number of attacks. I’m not going to touch on those for that just simply google “post exploitation” to get an idea of what you may want to accomplish next. At this point its a good idea to make sure you’re on the right computer and determine the types of credentials we have on our target machine. The following commands will determine that information. So we’re on the correct computer and we have “system” credentials which is the highest credentials you can have on a windows platform. Great success. At the heart of this metasploit module is some sql commands that will enable the xp_cmdshell. If you wanted to manually enable xp_cmdshell you could enter the sql commands below. That’s all folks, more could be covered here but this will get you started. Once again I haven’t covered anything new here and this documentation is meant to capture some of the common tasks that need to be completed when testing mssql. Hope this helps and happy mssql hunting. This entry was posted on Thursday, December 22nd, 2011 at 10:45 am	and is filed under databases. You can follow any responses to this entry through the RSS 2.0 feed. You can skip to the end and leave a response. Pinging is currently not allowed. Awesome, I was able to follow this step by step. I cannot find any sql commands in this module am I mistaken? Thanks for great tutorial I look forward to more. You know I didn’t actually look through the source code of the mssql_payload module I just assumed that was how it accomplished that task so if you didn’t see any sql commands in that module I’m curious how it pulls that off. I’ll have to browse the source myself and take another look. Good to hear this helped you, I was always forgetting all the steps myself so good to see others can benefit as well. It is really a great and helpful piece of info. I am happy that you just shared this helpful info with us. Please keep us informed like this. Thanks for sharing. Excellent guide, Travis! Comprehensive info on MS SQL security assessment. As a sysadmin with no pen-tester experience, who is enrolled in a pen-tester course, to fill a slot purchased by my employer, I must say that this post has helped me greatly. Thanks. Always glad to hear my thoughts helped someone else. Thanks for the positive feedback.